You should always label your images with ALT and title attributes in the source code so that search engines receive information about your images. 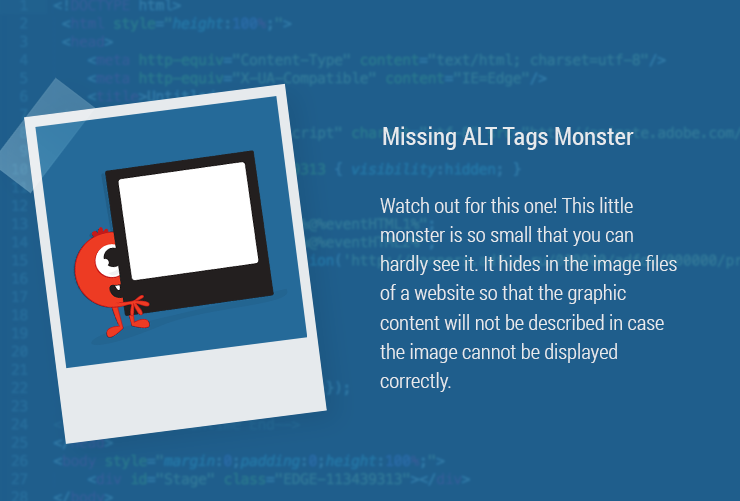 For every image, check whether or not the missing ALT attribute monster has struck your site, as this can have serious consequences. Finding good pictures for your website is undoubtedly very important for an appealing design. But don’t forget to add alternative text to the pictures when you insert them. This is necessary, on the one hand, so that barrier-free surfing is also possible on screen readers and, on the other hand, so that search engines can optimally read the images. These image descriptions are differentiated between ALT and title attributes. In the CMS, you usually have the option of entering this into a pre-defined field while inserting the image. The ALT attribute describes the contents of the graphic or the image. If an image is not displayed for technical reasons, the user can see from the ALT attribute what it contains. Thanks to these attributes, search engines can recognize the image contents. If the image has existed on the website for a long time, it can be found in the cache and in the universal search, independent of the functionality of your web presence. Therefore, your website can be found due to an optimized image. When the cursor rests on the image, you will see the title attribute (universal attribute) on the screen or on the display with a brief delay. Even if there are no technical problems with loading and all files are properly linked, the tag is very important, in particular, when there is no image signature available. Let’s assume that you are starting a blog with articles on sky diving with the goal of gaining medium-term customers who are booking sky diving with you. In summer, you released a blog post, for example, “Why sky diving is great.” For this article, you use an attractive photo of sky divers. However, if you don’t insert ALT attributes, the monster will hold your image under lock and key – the image will be invisible for Google Images and for your potential customers. You should also be careful when deleting old images from your data directory. If you forget to link the new image to the website, visitors to your site will only see a placeholder. Thanks to the ALT attribute, you can still see the connection with the text. The monster has been struck off, because your meaningful ALT attribute is now coming into use. With the message, you invite your reader to the website in spite of the missing visual elements, provided that the text is good and the website loads quickly. Ryte will help you to optimize your images with comprehensive reports. In the module Website Success, under the point “Assets (Static Content)”, click on the subpoint “Images.” The report “Status codes” shows whether all the visual elements are available on the site and properly linked. Only then is the status code 200 delivered. With the ALT text report (“Assets” > “Images” > “ALT Values”), you will also find images that do not contain ALT attributes. In your CMS, you can subsequently insert and optimize them. Images without alternative texts can be used by neither web crawlers nor readers. Ensure that you correctly name each graphic element – with the exception of decorative elements such as lines or buttons – and insert relevant keywords. Also, check whether a copyright has to be mentioned. Published on 06/28/2017 by Eva Wagner.